Fire fighting in the petrochemical, pharmaceutical and chemical process industries may be particularly complex, where, potentially every fire is a Hazmat incident. Large quantities of toxic fumes are frequently involved and may lead Company Emergency Response Team (CERT) members to undertake rash actions which constitute hazards to personnel. Therefore, it is essential for the ERT members to continue their proficiency in fire-fighting response. This intensive training will provide refresher training for the ERT members to enhance their knowledge and skills to handle the hazards of process plants correctly, in the event of an outbreak of fire and Hazmat incident which they are called on to fight. 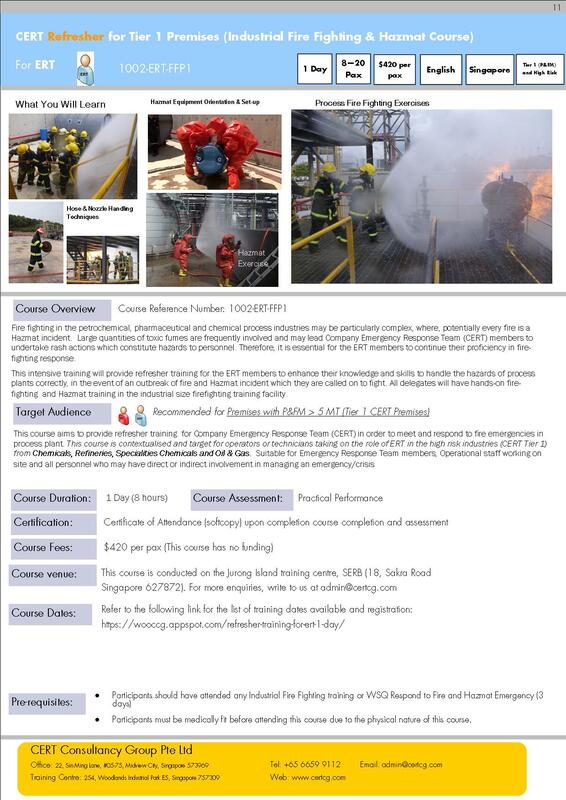 All delegates will have hands-on fire-fighting and Hazmat training in the industrial size firefighting training facility. Course venue: This course is conducted on the Jurong Island training centre, SERB (18, Sakra Road Singapore 627872). For more information or course registration, please write to us at admin@certcg.com.